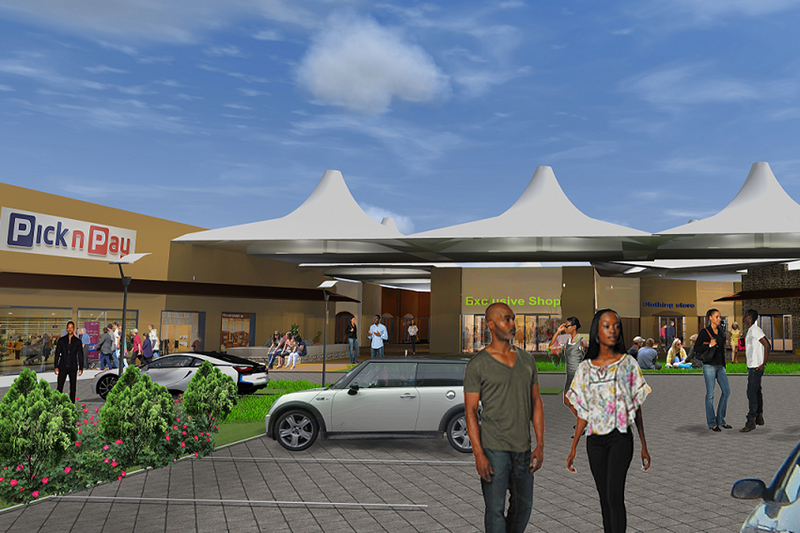 Tension Structures has been commissioned to design and install the walkway atriums; as well as two entrance roofs for an accumulative area of 2,500m2 at Lusaka’s new Garden City Mall in Zambia. This project features conical peaks reminiscent of snowcapped mountains that run along the entirety of the centre walkways of the mall. The fabric structures are made from steel flying masts fitted with TX30 fabric by Serge Ferrari. Tension Structures’ involvement was requested by Synergy Contracting, the developers on the project. Serge Ferrari’s newly released TX30 fabric is to be used as it has a translucency of up to 8%. As a result, the walkways in the mall do not require artificial lighting by day, but are sufficiently and even more effectively lit by the outside light diffusing through the fabric. In a country that is currently facing an energy crisis; decreasing the demand on Zambia’s grid for ongoing development projects such as these is vital. Furthermore, by night the artificial lighting is dispersed across the fabric illuminating the walkway throughout. Perhaps the most boastful property of Serge Ferrari’s Précontraint TX30, however, is its sustainable lifespan of up to 30 years. Culminating in a flourish at the end of two walkways are conical roofs at two of the entrance ways. The main entrance way boasts three linear cones with exaggerated peaks, and a further large peak covers a second entrance. The height and sculptural qualities of these entrances extend out from the building’s architecture leaving a large covered atrium below. The flying masts supporting the cones are notable as they don’t extend to the ground as a column would, but leave the area under the structures free from ground supports allowing shoppers at the Garden City Mall to move freely. They are also aesthetically pleasing much like flying sculptures lacing the ceiling above. Alternating with the flying masts along the walkways are latticed struts engineered by Tension Structures to assist in combating the resistance forces of the fabric structures on the building surrounds. Strut applications such as these now offer a solution for the engineers on the project facing similar challenges on future developments. Costs saved on the installation of ceilings such as these which don’t require daytime light fittings, as well as the subsequent energy saved, makes these fabric structures a sustainable and aesthetically pleasing solution for on-going development projects in Africa.